Michigan coach John Beilein addresses the media at the NCAA Final Four. Is the Big Ten regaining its swagger in NCAA Division I men’s basketball? Led by undefeated Michigan, the Big Ten leads all conferences with seven teams in this week’s edition of the Associated Press Top 25, according to the poll released on Monday. Michigan, an NCAA Tournament finalist last year, moved up one spot to fourth. Michigan State dropped one place to 10th. Others from the Big Ten in the seventh installment of the Top 25 include Ohio State (15), Wisconsin (16th), Indiana (22), Iowa (23) and Nebraska (25). The ACC has five teams in, including Duke (2), Virginia (5), North Carolina (9), Florida State (11) and Virginia Tech (13). Last year, the Big Ten’s image took a blow when only four of its teams reached the field of 68 in the NCAA Tournament. It was the lowest total for the conference since 2008. In addition, only two Big Ten schools — Michigan and Purdue — reached the Sweet 16. Michigan helped the conference save face when it stormed through the West as the No. 3 seed to reach the Final Four in San Antonio. At the Alamodome, Michigan knocked off Loyola-Chicago to reach the championship game, where it was throttled 79-62 by Villanova. 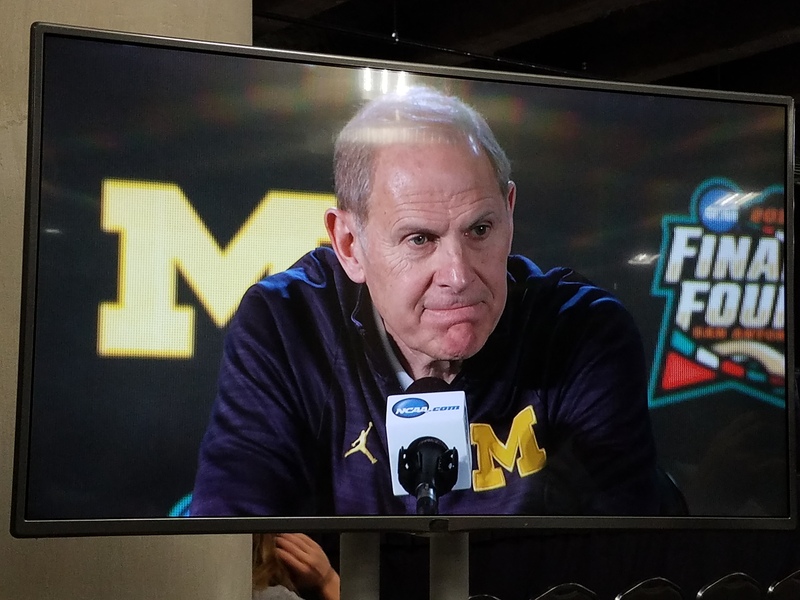 The Michigan Wolverines rallied in the second half Saturday night for a 69-57 victory over the Loyola-Chicago Ramblers in the NCAA Final Four semifinals at the Alamodome. With the win, Michigan advanced to play in Monday night’s title game against either Kansas or Villanova. Loyola-Chicago played well most of the night and seemed to be on its way to making history as the first No. 11 seed to advance to the championship game. The Ramblers led by 10 with 14:08 remaining. But the Wolverines hit the Ramblers with a 17-2 run in the second half to seize a 54-47 lead with 4:50 remaining, taking the life out of the Ramblers. Loyola never got closer than five the rest of the way. Forward Moritz ‘Moe’ Wagner produced 24 points and 15 rebounds to pace the Wolverines. Guard Charles Matthews scored 17. For Loyola, forward Cameron Krutwig had 17 points and six rebounds. “We’re elated to get a win like that, the way we did it,” Michigan coach John Beilein said. “You know, we see some really good defenses in the Big Ten. I would argue that it’s the best defensive league in the country. “We saw some great defense (from Loyola tonight). They’re a little bit smaller at the four positions, and they can really get into you and guard. And it really gave us problems in the first half. They rotated so quickly. “This has been our dilemma all year. 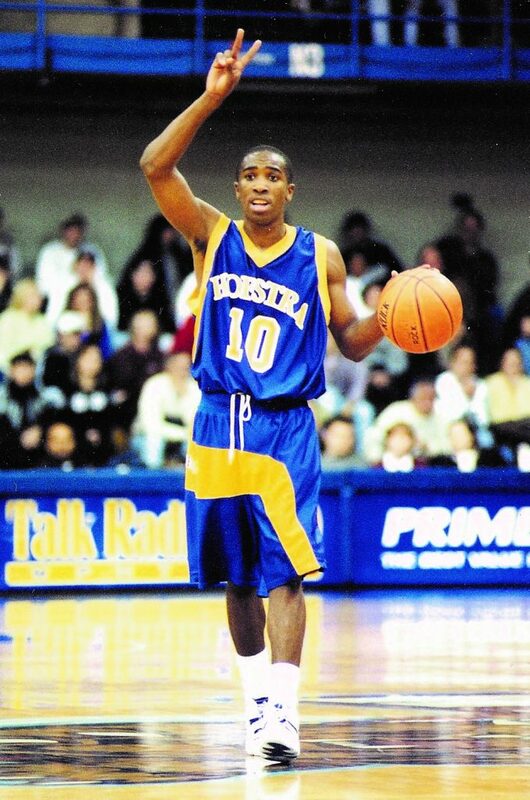 How are people going to guard a shooting five? Then we have to adjust as the game goes on. We didn’t adjust very well. “In the second half after we see their reactions, we had to make some shots. We couldn’t make em for awhile, but we did (eventually). Our young guys came in there and we took off like crazy. After a slow start, Loyola-Chicago stormed to a 29-22 halftime lead. Michigan held the upper hand early, taking advantage of skittish shooting by the Missouri Valley Conference champions and moving out to a 12-4 advantage. From there, the Wolverines went cold on offense, allowing the Ramblers to climb back into it. In the final five minutes, the Ramblers turned up the intensity and outscored the Wolverines, 14-7. Fans leaped from their seats and roared approval when Loyola’s Donte Ingram followed a miss with a short put back at the buzzer. No team seeded lower than 11th has ever reached the NCAA Final Four. Four others have made it to the final weekend, and all four lost in the first game, failing to reach the championship round. 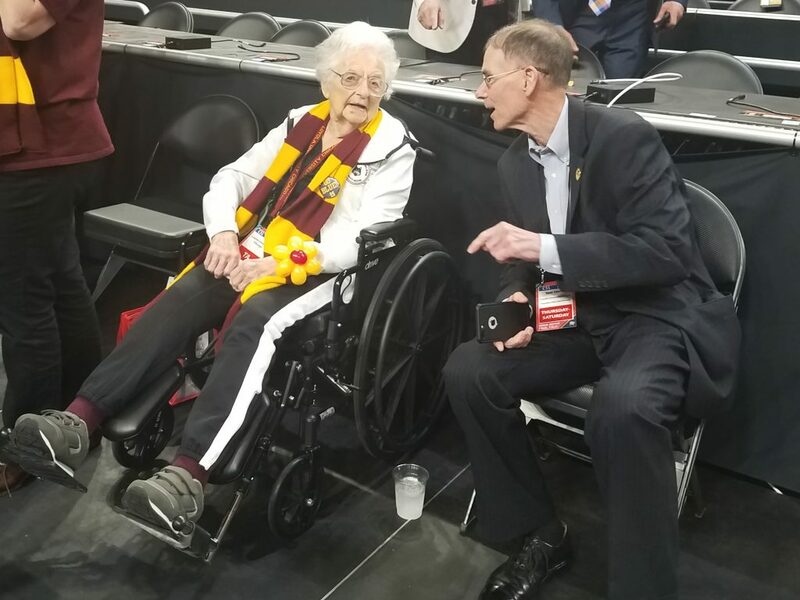 Sister Jean Dolores-Schmidt sits court-side at the Alamodome before tipoff of the Loyola-Michigan game.